Angels Walking, by Karen Kingsbury, is her newest book about Tyler Ames, a talented up and coming baseball player, whose life takes an unexpected turn. Just how would Alzheimer’s patient Virginia Hutchinson impact Tyler’s life for eternity? How would those changes ripple out and affect Tyler’s broken relationships with his parents and former girlfriend Sami Dawson? How in the world do angels figure into the story? Well…you’ll have to read it to find out. 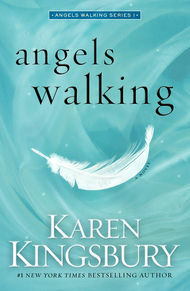 I’ve only read one other Karen Kingsbury book, but there was something about Angels Walking that drew me in. Perhaps it was Virginia the Alzheimer’s patient or maybe I was intrigued by the thought of angels, God’s messengers, at work in our lives. I knew I would find this book somewhat painful because my mother had Alzheimer’s but I wanted to read it and I’m so glad I did. Karen Kingsbury is a very gifted writer and has a beautiful turn of a phrase. She has a way of expressing feelings or a scene in a very vivid way that stays in the mind of the reader. What came through in this book were love, grace, forgiveness and redemption. I was reminded to never give up or stop praying and know that God is at work in our lives. Karen’s Christian faith is interwoven throughout this book in a beautiful way. There were a couple of times when Jesus Christ and salvation came up, but I found it fell short of a clear presentation of the gospel because sin wasn’t mentioned. Without knowledge of my sin, I don’t know of my need for a Savior. I recommend Angels Walking by Karen Kingsbury and look forward to future books in this series. Your heart will be touched when you read this book and perhaps some healing will also take place in those broken places in your life. I would like to thank the publishers at Howard Books and NetGalley for the opportunity to read Angels Walking in exchange for an honest review. I was under no obligation to provide a favorable review.